Monkey Boxing is a form of Down and dirty Kung Fu that is excellent for street self defense. It is perfect for the following self defense scenario. You’re walking home late at night. It’s cold and you shiver and pull your coat tighter. Pretty rough section of town to be in and you’ll be glad when you’re back in the better lit areas. If only you hadn’t chosen this shortcut. If only you had heard those sly footsteps behind you. .You’re walking home late at night. It’s cold and you shiver and pull your coat tighter. Pretty rough section of town to be in and you’ll be glad when tou’re back in the better litortcut. If only you had heard those sly footsteps behind you. “Hunh!” you grunt as one of the unseen thugs pushes you in the back.“Hunh! You grunt as you hit the ground, and then you are being kicked in the ribs. Hard! And it hurts! Not a pleasant scenario, and while it’s nice to say you should have ‘felt’ the thugs coming, the fact remains that you are on the ground and the situation has to be handled. One: The type of people who prey upon citizens in the above example do not want you standing on your feet. They specialize in ‘sneak’ attacks. 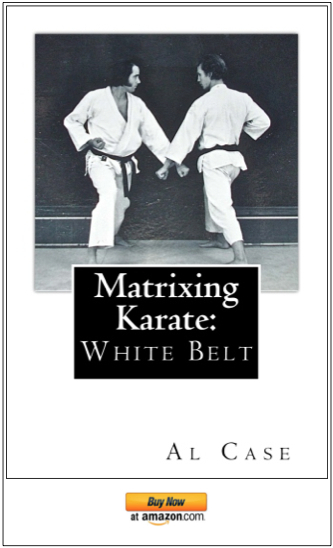 Two: Many Martial Arts do not address the problems of ground fighting at all. Three: The fact remains from above. 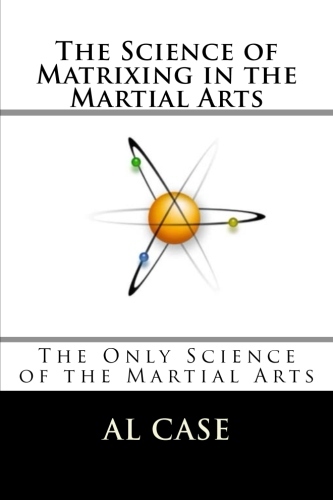 Regardless of all your martial arts training, you are on the ground and those kicks hurt! 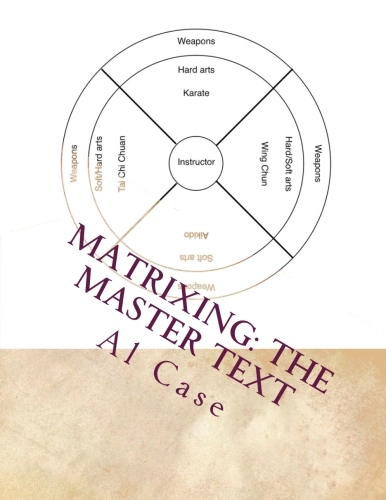 Solution: A simple strength building exercise called ‘Monkey in a Box,’ which is one of the first exercises of Jing Mu (Butterfly Palm) Shaolin Kung Fu. The ‘Box’ consists of a square drawn upon the ground. The square is to be drawn to fit your body dimensions. The Monkey is you. As you twist and struggle to fit inside the box you will understand why the ‘Monkey’ best describes you. Assume a push up position in the box. Now move one leg under your body across the square in a diagonal manner. Simultaneously move the arm on the other side of the body over the body. As your foot replaces your hand and your hand replaces your foot will find that you are in an upside down push up position. Continue this type of motion and you will find that you progressively face each side of the room (box). A good way to begin the ‘Monkey in the Box’ exercise is to ‘Front roll’, or ‘back roll’ into and out of the box. This exercise will increase your arm strength while giving flexibility in a ‘close to the ground’ position. This is basically a four limbed ‘hopping’ exercise. To start assume the basic push up position, then select the direction you wish to face and ‘hop’ with all four limbs to a position ninety degrees from where you started. This exercise will strengthen the wrists, so that the sudden shock of falling on hard surfaces will not break them. When you are hopping fairly well try hopping while in the face up push up position. A more advanced hop would be to contort from face down to face up while selecting the direction you wish to face. The hopping exercises will give explosive force to your flexibility. Following are examples of how to use the ‘Monkey in a Box’ for actual defense. Please go slowly when first practicing so that you don’t damage either yourself or your partner. 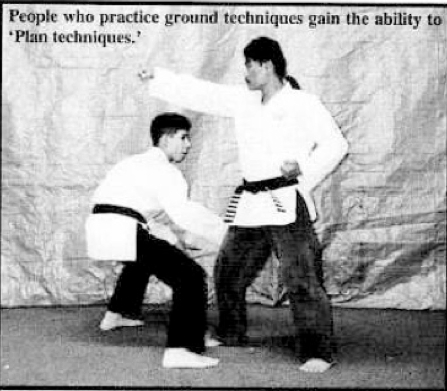 People who practice groundwork must any fear of falling to the ground and even learn to use falling on the ground as an advantage. 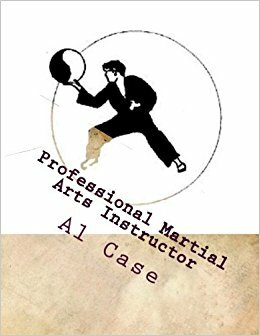 Advanced practitioners can use ‘Monkey in the Box’ techniques as planned self defense. scissors technique to the attacker’s leg. Learn to place the hip down softly, rather than slamming it down. Attacker pushes from the rear. 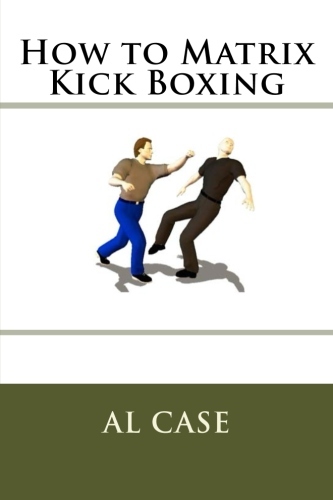 The defender falls forward and catches himself, then hop/twists over to kick the attacker. 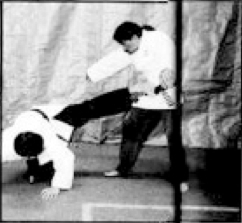 Advanced versions of this technique will have the practitioner twisting into the face up position while falling. The attacker punches to the face. 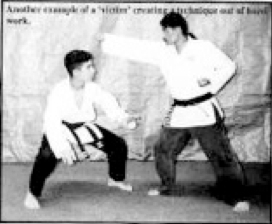 Another example of a panned technique has the Defender falling under and away from the Attacker’s punch while twisting so as to be able to catch himself on his hands and yet launch a side kick into the attacker’s mid-section. The attacker punches to the face. 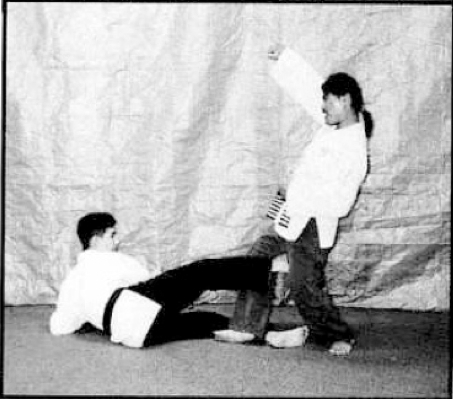 Another extremely effective technique, the practitioner falls forward with the shoulder into the attacker’s knee while grabbing the attacker’s ankle with his hand. Continuing this motion into a forward roll the defender will break the Attacker’s Knee en route to spiking an elbow to the solar plexus. This has been a Monkey Boxing Article. Just wondering what the story is behind this style wearing a Gi?